Beirut, the capital of the Lebanese Republic, has long been considered, by virtue of its strategic location, the crossroads between the three continents of Asia, Africa and Europe, and the gateway to the East. Its million inhabitants are a unique blend of the Eastern and Western cultures. Named Beroth, the city of wells, by the Phoenicians. It is one of the oldest settlements of man as evidenced by relics from the prehistoric communities. In Phoenician times, however, it was dwarfed by thriving Byblos, Sidon and Tyre. When occupied by the Romans under the command of Pompey in 64 B.C., it entered the most glorious period of its ancient history. In 15 B.C. it was named Colonia Julia Augusta Felix Berythus and acquired the rights of a Roman city-state. What most contributed to its fame, however, was its School of Law which, under Septimus Severus (192 - 211 A.D.) excelled the Schools of Constantinople and Athens and rivalled that of Rome. 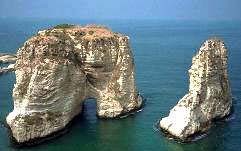 Beirut retains to this day its role as a great cultural center with great impact on the Middle Eastern region. Its 8 universities have graduated a large number of the area's prime movers and shakers. Its newspapers and publications are read by thousands throughout the Middle East, and it remains the publishing center for the whole area. It is a commercial, banking and financial center for the region as a whole, with about 85 Lebanese and foreign banks, countless import-export companies, arbitrage and triangular trade operations and free exchange market. 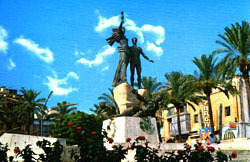 The capital still has many touristic attractions to offer, among them the American University of Beirut Museum, the Sursock Museum, the Pigeons' Grotto, many shopping centers and a large number of restaurants with succulent menus from cuisines of the world as well as local Lebanese specialties.